If a library's periodical collection is a reflection of its community, patrons of Ketchum's Community Library have a great interest in current events, the outdoors, health and politics—and harbor a few guilty pleasures. Whether that is sufficient to reflect patrons' tastes is being determined. 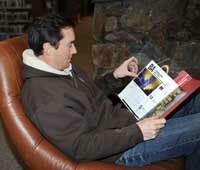 The Community Library is seeking opinions about what magazines patrons would like to see on shelves. A poll at www.librarydenizen.wordpress.com will help determine if the library has struck the right balance. "We want to get as many viewpoints and resources out to our patrons as we can," said Cathy Butterfield, collection manager. "That includes visitors from all over the world as well as hard-core locals that support us so well. This is for the patrons. That's why we want them to tell us what they think." The Community Library currently has more than 140 magazines, newspapers, children's publications and professional library journals. Subjects range from archaeology to yoga, titles from Forbes to People. The number of magazines varies from year to year, depending on the budget and on donations. "It runs the gamut from liberal to conservative, entertaining to informative," she said. "We try to have the library serve everybody. Not everybody wants to read the same thing." Lyman Drake, library board chair, said periodicals help inform the voting public, which is vital to a democracy and has special significance this year. He recently donated subscriptions to publications that cover national and foreign policy and education issues, including Democracy, Washington Monthly, The National Interest, Foreign Affairs, Foreign Policy, The American Scholar, World Policy Journal and others. Drake said offering publications that examine and analyze complex issues helps fill the gap left by the more mainstream media, which he said treats politics as a popularity contest rather than focusing on the more important issues of public policy and how those decisions shape our lives. "We live in a well-educated community among people with the interest and capacity to become well informed on the important issues—going well beyond the spectacle of politics," he said. "At the library we are trying to make available to the public a collection of journals that present serious analysis of the major public policy issues from a wide range of perspectives. With this initiative the library hopes to foster open-mindedness and mutual understanding in our community. This is just one of many ways the library seeks to be relevant to the needs and interests of our valley." Though not all those publications have appeared on shelves yet, there will be many from which to choose before voters go to the polls. "By the time Idaho's elections roll around, we'll have a ton," Butterfield said. The current magazine list (which does not yet include all new titles) can be found at www.thecommunitylibrary.org/page.php?npID=9. To tell the library what else you'd like to see, log on to www.librarydenizen.wordpress.com and scroll down to the magazine poll. The board of trustees of the Community Library Association announced the election of officers for 2012. Lyman Drake will serve as board chair, Leslie Silva as vice chair, Neil Bradshaw as treasurer and Bill Lowe as secretary. All officers are trustees of the association and are elected annually for one-year terms by vote of the board. The Community Library has launched a new children's library website, http://kids.thecommunitylibrary.org/, and blog, http://thecommunitylibrarykids.wordpress.com/. The library is looking for feedback on any topic. Click on the new red "Feedback" tab on the left-hand side of each web page at www.thecommunitylibrary.org/.